Austin Powers had good reasons for being scared of carny folk: “Nomads, you know. Smell like cabbage. Little hands.” This traveling fair is even worse. It is downright evil, in a smells-like-Sulphur kind of way. However, Daisy will try to scheme her way out of the supernatural sideshow that bears her name in the web-series Welcome to Daisyland, directed and co-written by Tony E. Valenzuela, which premieres on BlackBoxTV’s YouTube channel this Thursday (Valentine’s Day). The first thing you will notice about Welcome is the unsubtly blaring hard rock soundtrack provided by the Dead Daisies (co-founded by series co-executive producer David Lowy). It is so pervasive, it the web-series could almost be dismissed as a collection of music videos for the band, but there is a legit reason for all the swamp rock. Daisy agreed to serve as the “Ringmaster” of the infernal carnival as part of a Faustian bargain she struck with a mysterious demon to bring back her rocker lover after he died from a drug overdose. Now she travels through the forgotten backwaters of flyover country, along Route 666, picking up souls for her master. The first four episodes introduce some of Daisy’s sinister colleagues and their signature killing styles, but the promised conflict between Daisy and her Mephistophelean puppet master are far more intriguing. Each episode is about five to seven minutes, including the opening and closing credits, so it is not a huge investment of time. Nevertheless, it is not as grabby right out of the gate as the first two episodes of Ravenwolf Towers, which Full Moon seems to have converted from a web series into a feature release. Nevertheless, Pippa Sonuga has a nice vampy screen presence and maintains the character’s mysteriously ambiguous nature, at least thus far. There seems to be a good deal of improvement over the course of the first episode to the fourth, but it still probably isn’t essential viewing. 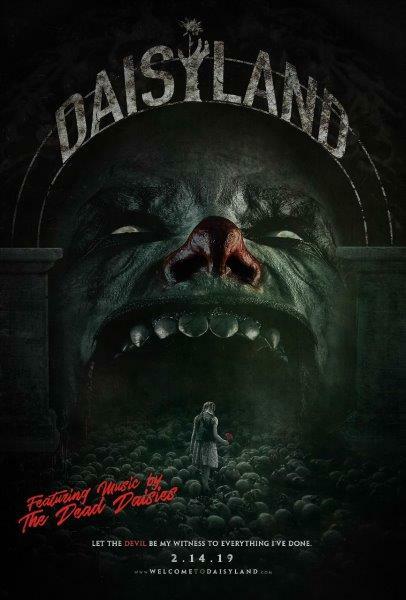 For fans of the Dead Daisies and carnival-circus-themed horror, Welcome to Daisyland premieres this Thursday (2/14), via BlackBoxTV.